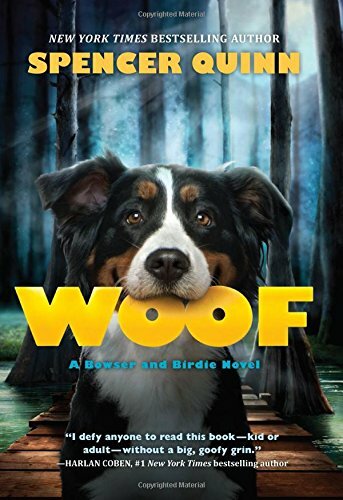 Spencer Quinn’s new book is Woof, and Woof is a delightful contribution to children’s literature. Quinn has written a book that is bound to become a classic. Simply, the author knows how to tell a tale. He balances elements of plot, demonstrates the nature of his characters, and uses time to generate suspense, yet keeps his readers hopeful. Issues arise and wane, only to return with more importance, building the tale for young readers. Quinn also develops the personality of Birdie, the strong and opinionated 11-year-old heroine; her friend, Tory; and importantly, Bowser. Kids love dogs, and Bowser is a mutt, a talking dog who narrates much of the story. He entertains readers with his vision of what is going on with the book’s humans. At times Bowser is puzzled, and this is usually hilarious when he misunderstands or suddenly does understands their behavior and, in fact, appreciates it. The humor when Bowser doesn’t quite get it is rich. Young readers will easily imagine Bowser as a talking dog. Adult readers will find irony and humor throughout the book. Quinn has also mastered timing, important in children’s books. His paragraphs are suitable lengths, rather short. Just as important, the vocabulary the Quinn uses is perfect so that the young reader may have to stretch a bit to understand new words. Further, the Louisiana setting is carefully captured by the author’s words: heat, lakes, bayou, and “gators, too.” Capturing the dialect of the author’s of the character is difficult for writers, but Quinn has an answer: to use less slang, which might ruin the young reader’s spelling. But then he solves the problem with careful, exact word choice, something lesser talents may ignore. A perfect gift for young readers (and for adults in need of an easy read). Sally D. Ketchum is the author of Super Student, Happy Kid and Bread Garden, a middle grade novel that teaches higher level thinking skills. A teacher with many honors, she has been a consultant to teachers and students in all grades, and has taught writing at two colleges.